Across all his incarnations, the Doctor’s character has always stayed true to a few core traits, perhaps none more so than his restless, insatiable curiosity and wanderlust. He’s a traveler, winding his way around the universe on a flightplan drawn up with no grand scheme in mind other than to see the next new thing. He rarely knows where he’s going, and rarely plans ahead. He just steps out of the ship and looks around. And from the beginning, that has always gotten him into trouble. Which is only to be expected. That’s the basic setup of the whole show: He arrives somewhere, he gets into trouble, he gets out of trouble, and he leaves. It’d be a pretty boring show without the middle bit. But still: It’s a dangerous universe out there. You’d have to be foolish to go out there without a plan, armed with nothing but your wits. And you’d have to be criminally reckless to take people with you. One of the things that makes “The Caves Of Androzani” great is that it cuts to the heart of this problem and brutally critiques it. Here, the Doctor gets himself and his companion Peri into a deadly mess that rapidly shows itself to be much worse than he bargained for, and against which the best he can reasonably hope for is base survival and escape. In the end, he can’t even manage that. He saves Peri but sacrifices himself to do so, as Peter Davison’s Fifth Doctor collapses, and essentially dies, regenerating into Colin Baker’s Sixth. “The Caves Of Androzani” enjoys a very high reputation in Doctor Who fandom; in fact, Doctor Who Magazine’s 2009 readers’ poll named it the best story in series history. I can’t go quite that far, though it would certainly make my top 10 or 15. For one thing, though this is admittedly minor, you’ve gotta take some points off for the the magma beast, just a sad, sad, weak attempt at the obligatory monster-of-the-week. But what really bothers me about this one is how corrosively cynical and dark it is. And I say this as a fan of corrosively cynical and dark stories in general, and of the cynical and dark mind of Robert Holmes, who wrote this one, in particular. It’s the whole point of the story, of course, so in essence I’m objecting to Holmes hitting the bullseye. But in the final analysis I just can’t buy into the notion that a story this pessimistic is what Doctor Who is about, on a grand scale. Still, I can see why it won that poll. It’s a terrifically propulsive, twisty thriller, well-directed by Graeme Harper—tense, raw and very dark. It vividly creates a world that has been corrupted, perhaps irreversibly, by the toxic effects of greed, violence, and unchecked corporate power, and which has poisoned the souls of every character we meet—especially the revenge-crazed maniac Sharaz Jek, a creepy and intense but ultimately pitiable Phantom Of The Opera-like figure vividly played by Christopher Gable. And it made excellent use of the extra dramatic weight that all regeneration stories get as the closing chapters of their eras, really putting the increasingly desperate Doctor through the wringer and making him fight with his every last breath. Davison makes the most of it, giving one of his best performances in a script that gives him a lot to work with. “Caves Of Androzani” is also one of those stories that looks even better in the context of its mediocre era. This was the last really good story Doctor Who would do for about three years, until the Seventh Doctor era started to hit its stride. Season 21 was bookended by two truly awful trainwrecks, “Warriors Of The Deep” and “The Twin Dilemma,” and was helmed by the show’s worst creative team, producer John Nathan-Turner and script editor Eric Saward, whose combined vision, despite their intentions, tended to make the show tacky, vulgar, and nihilistic, full of sound and fury and signifying nothing. And if you look at the plot of “Caves” on paper, it fits almost too well next to Saward’s most misanthropic, least watchable stuff. But somehow “Caves Of Androzani” not only rises above the rest of its era, but shows that Saward’s approach could work very well in the hands of a really good writer—like Holmes, the quintessential Doctor Who scribe. As the story begins, the TARDIS lands on a desolate, sandy rock, Androzani Minor, part of a twin-planet system with the nearby, populated Androzani Major. The Doctor has come on a benign, almost boring mission: He needs some sand to make a new glass tube for one of the widgets in the TARDIS machinery. He’s been to the Androzani system before, but characteristically, isn’t sure when: “I don't remember. I'm pretty sure it wasn't the future….” And he hasn’t bothered to figure out what’s happening there right now, assuming that Androzani Minor is abandoned because of the deadly mud eruptions that happen periodically. It’s a crucial mistake, because besides sand, Androzani Minor has another valuable resource—spectrox, which can be refined into a powerful immortality drug and which has made some people on Major very, very rich and powerful. The economics of the spectrox trade combine the worst qualities of oil and heroin, and like them, spectrox spurs bloody wars over who controls it. That’s what the Doctor and Peri unthinkingly walk into: A decades-long bloody stalemate between a Major-based conglomerate led by the cold, ruthless, and viciously self-interested Morgus, and on the other side, Morgus’ former partner Sharaz Jek, a brilliant scientist-turned-terrorist who is hideously disfigured and insane, and who bollixes up the flow of spectrox down on Minor with an army of unbeatable androids. Jek is also working with a motley crew of gunrunners led by the psychotic Stotz, who keep him supplied with arms and equipment in exchange for spectrox. Things go badly almost immediately for the Doctor and Peri. First, while exploring the caves, Peri falls into a hole and has to be rescued, covering both of them in a white, weblike substance—seemingly harmless at the time, it turns out to be spectrox in its raw form, condemning them to death by slow poison. Continuing on, they walk right into the gunrunners’ weapon cache just in time to be captured by a military raid and brought to the army chief, General Chellak, cursorily interrogated and accused of being spies for Jek, and sentenced to death. Holmes constantly ratchets up the tension and danger level on the Doctor and Peri, never giving them a safe place to rest but shifting them instead between a series of frying pans and fires. Jek rescues them, but he’s no friend—he’s only done it out of a creepy fixation on Peri’s beauty, and isn’t interested in the Doctor at all. The Doctor convinces a fellow captive, Chellak’s lieutenant Salateen, to help them escape, but Salateen betrays the Doctor and takes Peri back to Chellak. Salateen’s escape, by the way, is the key to the downfall of both Jek and Morgus—his knowledge of Jek’s defenses allows the stalemate to be broken, and the war to reach its bloody conclusion. And here’s the Sawardian weak-hero thing done right: All the Doctor really does is convince Salateen, who has grown despondent after months of imprisonment under Jek, to act. The Doctor had no idea of how significant this would be. He just wanted to get Peri and himself to safety. It’s the only thing he does in the whole story that has real consequences for either of the two major players, Morgus and Jek, and it’s not intentional in that way. It just pushes over all the other dominoes. The Doctor’s work is pretty much over as far as the larger story is concerned, even though still he gets a terrifically exciting scene at the cliffhanger of the third episode, commandeering the mercenaries’ ship to deliberately crash-land it back on Androzani Minor in a desperate, last-ditch attempt to save Peri by finding the antidote to raw spectrox. At last, after being beaten down for so much of the story, the hero gets to act, but it’s a hail-Mary and not a decisive strike to save the day, thrilling in part because this time there’s a real chance it won’t work. This is a story with no strong heroes but several frighteningly capable and domineering villains, each in their own way. Stotz is a purely physical and immediate threat, asserting his primacy over his disgruntled second-in-command in the time-honored way of cavemen by threatening to kill him by knifeblade, poison and pushing him off a high cliff. Morgus is a fan of murder-by-long-fall as well, but his real danger is his deviousness in service of his greed. Despite Jek’s flamboyance, Morgus is clearly the story’s true villain. Thanks to his political connections, Morgus has the army under his thumb. But because it’s good for the spectrox prices to disrupt the spectrox trade, he also funds Stotz and his gunrunners, who supply Sharaz Jek. This also gives him the excuse he needs to close his factories on Androzani Major and convert them into prison-slave workhouses that do the same job for free. He’s ultimately responsible for all the major horrors we see here, and a powerfully corrosive force on his own society. Without the supplies Jek gets from Stotz, which ultimately come from Morgus, all of this would have ended years ago, without the Doctor needing to show up. Knock Morgus out of the equation, and things will get better. Assuming, that is, that his replacement, Trau Timmons, doesn’t turn out to be just as viciously self-interested in the long run—that’s a happy ending that I don’t think Holmes would want us to assume. There’s not much innocence to be found on Androzani. And perhaps the only person in the story who seems to care about that lack of innocence is, oddly enough, Sharaz Jek, who is fixated on Peri not only because she’s pretty but because she hasn’t been corrupted the way everyone else he knows has been. Jek has been deeply corrupted himself—like Morgus, his power rests on control of the spectrox industry, and he does not appear to have any noble intentions for it either. Jek falls into a classic Robert Holmes villain type: The twisted monstrosity lurking in an underground lair and driven by a connection to a perverse, almost alchemical secret to eternal life and vigor. It’s a well that Holmes went to at least four times when he was script editor during the early Fourth Doctor years, with the antagonists of “The Deadly Assassin,” “The Brain Of Morbius,” “Pyramids Of Mars,” and “The Talons Of Weng-Chiang.” Jek is different, though, in that he’s not seeking eternal life—he already has it, with his control of the spectrox flow, and he knows it’s not enough. Like the Phantom Of the Opera, Jek is too complex to be pigeonholed as good or evil. He has real grievances against Morgus, who richly deserves anything Jek has cooked up for him and more. He is as ruthless and dangerous as a snake, but his deep emotional trauma makes him pitiable—but also creepy and perverse. Getting back to that idea of the Doctor’s reckless approach to traveling: That is, of course, a running theme going back to the earliest days of the show, but some eras hit that harder than others. The First Doctor’s first trip with Ian, Barbara, and Susan nearly got them all cannibalized by cavemen, and for a long time his adventures were driven more by trying to get back to safety than any loftier concern. Later, though, the series settled into a mode where he was increasingly at ease with whatever the universe threw at him, from the crafty little man of the Second Doctor to the dashing man of action of the Third to the overwhelming hurricane of confidence and eccentricity that was the Fourth. 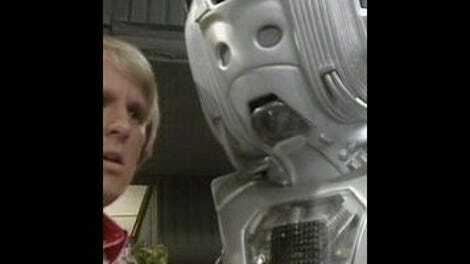 Peter Davison’s Fifth Doctor had been a reaction against all that; although he was younger and physically fitter than ever before, he was also vulnerable and frail in a way he hadn’t been since William Hartnell was the star. In Davison’s first story, “Castrovalva,” the Doctor was so weakened by his regeneration that he nearly died from mere exhaustion. “Earthshock,” written by Saward, had seen the death of his companion Adric, announcing clearly that this time around, he wasn’t always going to win. And the buildup to the Fifth Doctor’s final story throughout season 21 had kept that idea going. “Warriors Of The Deep” had ended in a pointless massacre, “Resurrection Of The Daleks” with a companion, Tegan, leaving the TARDIS behind forever because she couldn’t stand the constant violence anymore, and in “Planet Of Fire,” the Doctor was forced to mercy-kill his terminally wounded robot friend Kamilion after the Master had suborned it in a failed revenge scheme. Saward was also questionably fascinated by stories where the traditional hero role is weakened and even totally collapsed, which often reduced the Doctor and his companions to absurdly peripheral roles in what the title of the show implies is his story. It’s a major reason why so much of the Sixth Doctor era is so difficult to watch, but Holmes takes the idea and actually makes it work, by making the Doctor and Peri’s struggle to survive weave around the events that are unfolding around them without actually intersecting them as much as it might seem. Although the arrival of the TARDIS kicks off a disruption of the local balance of power that eventually overthrows the evil Morgus who sits at its apex, the larger issues of the plot resolve themselves without the Doctor or Peri as a major, direct cause—basically, other than showing up, they’re minor figures in someone else’s drama. The best that the Doctor can do here, as a direct action, is to see that he and Peri get out of the whole mess in one piece, and avoid a swift, brutal death leaving nothing behind but a horrifying blood smear and the smoking remains of a panama hat. And, of course, he fails. This is miles away from the glib, wizardly Doctor who can restart the universe with a bit of intense handwaving and some deliberately obscurantist technobabble. There’s a good case to be made that this vulnerability is an essential part of the show’s roots, and a mode that it needs to keep close to in order to stay true to the truest spirit of what Doctor Who is about. After all, the First Doctor and his friends were constantly in real peril, and often spent an entire story unable to do more than try to survive long enough to get back to the TARDIS. That’s one of the central tenets of the show: It’s a very dangerous universe out there, full of horrors, and woe betide you if you get lost in it. 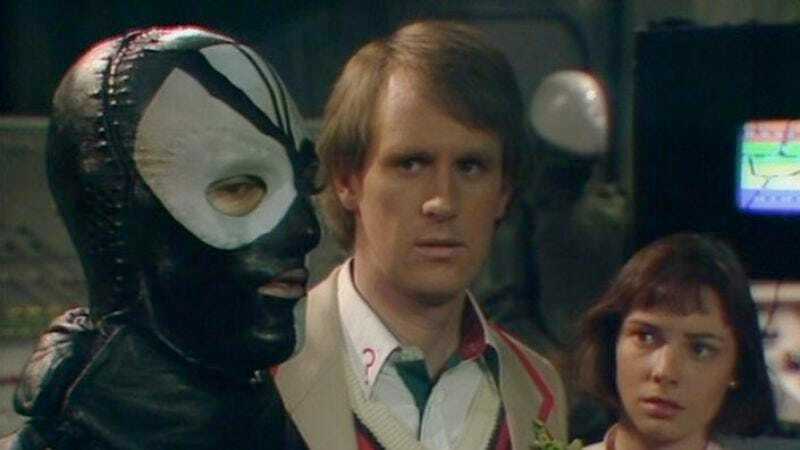 But though “The Caves Of Androzani” illustrates this point excellently, it’s missing anything of the other side of that argument, without which you don’t truly have the spirit of Doctor Who at heart: That there are good reasons to travel around the universe. Because this is also one of the central tenets of the show: It’s an amazing universe out there, full of wonders, and what a rare privilege it would be for you to get lost in it. Eric Saward’s version of the show never got this. The next era, under script editor Andrew Cartmel, very much did, to its credit. • Jek’s map of the Androzani mines looks uncannily like the 1980s video game Dig Dug.